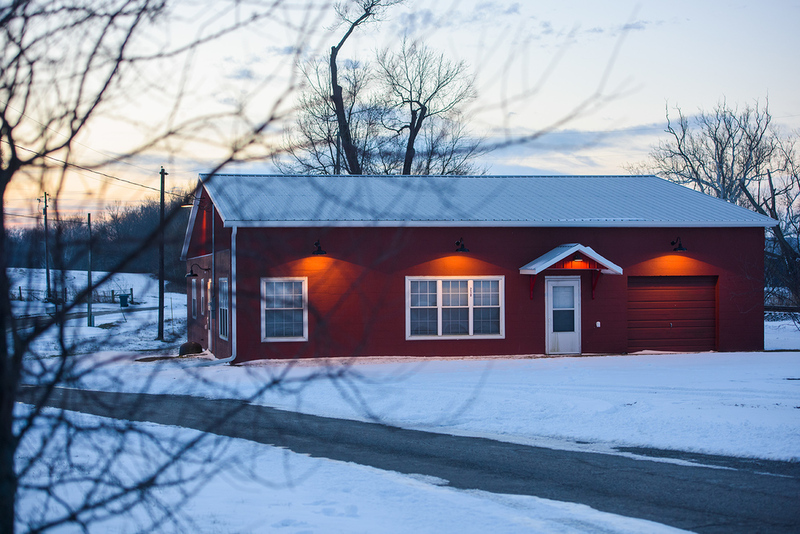 The Boyd’s Station PLACE+SPACE CREATIVE RESIDENCE program provides ZERO-COST creative studio space and housing in the village of Boyd, Kentucky for student and professional artists and writers. Creators live in a rural and serene environment to "live free and create" for periods from one to twelve months in which to pursue their individual craft without distractions in a supportive community. The Withers House is the first Boyd's Station creative residence. This home built by Boyd native Lena Withers in the 1930's was completely remodeled and updated in 2015 able to accommodate up to three people. The Shop is the first Boyd's Station creative studio space. Nearly 3,000 square feet of finished space available to use year round as the anchor of all studio activities at Boyd's Station. Visual artists (emerging or established) over the age of 21 can apply to Boyd’s Station creative residence program (PLACE+SPACE) requesting a short term, three month, six month or twelve month residency period. Also, any writer over the age of 21 (emerging or established - novelist, poet, short story, music) seeking a four to twelve week residency to concentrate solely on his or her creative work. The ideal Boyd's Station PLACE+SPACE candidate would be someone seeking to finish a started work or conceptual idea needing secluded time away from the normal pace of life to complete their work within a supportive community of creative individuals. Candidates for the creative residence program are challenging, progressive artists who are self-directed, motivated, and passionate about creating new art while furthering their career in their chosen field of artistic endeavor. Finalists are chosen on the basis of artistic merit by the board of directors of Boyd’s Station seeking to create a community of diverse artistic disciplines. Emerging Artist – Artists in the early stages of their career who would benefit from an extended period of time to focus mainly on their work without the bother of providing resources for rent and studio space. Typical residents might include those who completed BFA or MFA programs within the past ten years or current university art students between semesters working to build a portfolio of work. Most will not have had the opportunity to have a significant exhibition in a gallery or museum or have yet to place a piece in major collections. Established Artist – Artists who have established a career in the visual arts. Typical residents might include those who have had a major exhibition, and/or had pieces placed in major collections. They may also teach visual arts in respected colleges and universities. Most will have had more than ten years of active studio practice and are looking for a place to freely create while actively embracing a collaborative community of like and emerging artists. WHAT WILL AN ARTIST BE PROVIDED? Artists selected for any of the residency periods will be provided rent-free shared housing in Boyd, Kentucky. All utilities including high speed internet and shared free long distance telephone service will be provided by Boyd’s Station. Each artist will be provided ample rent-free studio space. Currently, facilities will limit certain applicants like welders, glass and print artists who require special tools not available at Boyd’s Station at this time. But, that should not limit those artists from applying and expressing why they would thrive and produce during a Boyd’s Station creative residence program if limitation of equipment were addressed. Artists are responsible for all equipment that they require which is not provided by Boyd’s Station. All meals, food and other basic personal needs will be the responsibility of each artist. It will be the responsibility of the all creative residents to maintain normal housekeeping chores of their residences. Artists chosen for Boyd’s Station creative residence programs will be asked to “blog” on the Boyd’s Station website about their daily experience and creative projects routinely as well as on other social media outlets during their time in Boyd. Boyd’s Station hopes each participant becomes an enthusiastic alumni member after their time in Harrison County and as their career advances. By being a good community neighbor, creative residents at Boyd’s Station will be responsible for providing community based outreach program offering their artistic vision and passion to the people of Harrison County, Kentucky. This art program is not meant to take away valuable time from the artist’s experience while in Harrison County but Boyd’s Station believes the programs conducted by the creative residents are not only beneficial for the Harrison County community but for the artists themselves in their professional development. WHAT DOES THE ARTIST HAVE TO PAY? Besides the $25 non-refundable application donation to Boyd's Station, there are no further fees payable to Boyd's Station. All application donations are considered tax free donations to Boyd’s Station, a Kentucky 501(c)(3) nonprofit organization; all donations of funds and “in-kind” goods are tax-deductible to the fullest extent permissible by law. All application fees are used exclusively to support the Boyd’s Station’s creative residence programs. Other than performing normal housekeeping chores in and around the residence and studio spaces, there are no financial obligations to the creative residents for utilizing living or studio space while at Boyd's Station and no utility payments. The only cost to the artist is that of meals and other food and personal needs, transportation, professional supplies and equipment. Boyd’s Station suggests that creative residents secure a personal accident insurance policy to cover themselves during the residency period. WHO OWNS THE WORK PRODUCED WHILE AT BOYD’S STATION? It is not mandatory for an artist to donate any physical work to Boyd’s Station other than their time conducting a community outreach program. Of course, any resident can provide Boyd’s Station with a selection of their work to be proudly placed in the permanent collection of Boyd’s Station. If an artists so desires, works can be donated to be auctioned, sold or utilized in fundraising for Boyd's Station programs. The artist agrees that artwork or visual representation of the work produced under the Boyd’s Station residency programs may be used in promoting the Boyd's Station mission and brand, exhibits and for educational purposes by Boyd’s Station or by its nonprofit cooperating associations. The artist retains all copyrights associated with work produced under the Boyd’s Station residence programs. When the artist reproduces the work for his/her own purposes, captioning or publication information must include the language: “This work was produced during the PLACE+SPACE Creative Residence Program at Boyd’s Station. HOW DOES BOYD’S STATION RECEIVE FUNDING? Through private donations, grants and the generous local support, Boyd’s Station is able to provide a place for artists to create while striving towards career sustainability. With future generous support and donations, plans to expand studio space, acquire major equipment to support welders, glass artists and print makers, remodel more homes and studio space accommodating up to ten artists at any given time and further expanding arts programs will be realized.